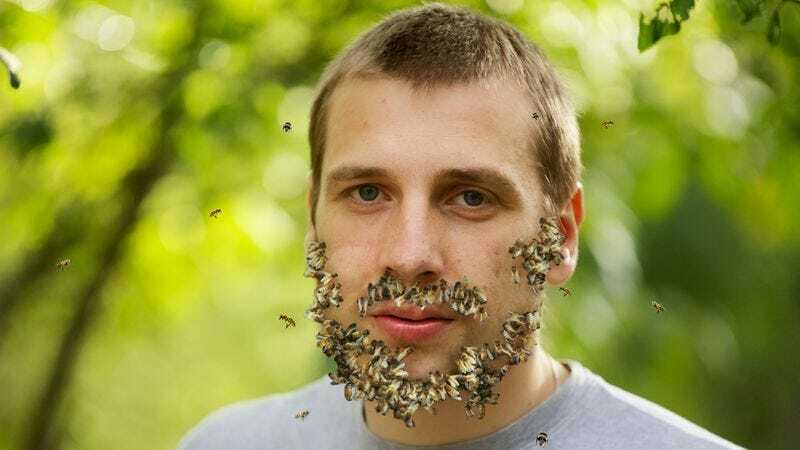 BURLINGTON, VT—Complaining of patchiness and uneven color, area man Matthew Cruickshank, 34, told reporters Monday that he has always had trouble growing a full beard of bees. “For some reason, when the bees come in they just won’t connect my mustache to my goatee, and they seem to thin out halfway up my cheek,” said Cruickshank, examining a beeless patch of skin on his neck and noting how one random gray bee always appears in the middle of his chin. “It’s strange because my dad always had a full, thick beard of bees his whole life. I guess some guys are just lucky that way.” Cruickshank added that although he grooms his beard of bees frequently, it often becomes itchy and uncomfortable, especially at night when he’s trying to sleep.